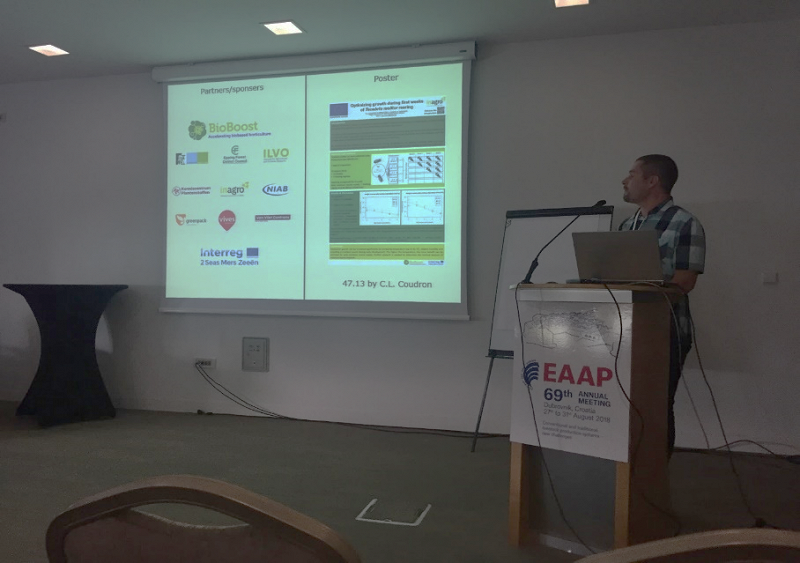 Researcher David Deruytter presented on behalf of BioBoost research results results regarding meal worm growing at the European Federation of Animal Science conference (EAAP, 27-31 August 2017). He was awarded with best presentation in his category! As a farmer it is important to know how many animals you have. This to be able to feed exactly the necessary dose or to assess future income. The number of cows in the meadow is easy to count, for meal worms this is a lot harder. It's thousands to tens of thousands of larvae that, certainly the first week, are nearly not visible. The number of meal worms per bucket is necessary to know to grow the bugs efficiently on a large scale. How do you count meal worms? Inagro has done research on this topic within the project BioBoost. The researchers applied different techniques. First a big experiment was set up with different number of beetles, different number of days of laying eggs and different sizes of trays. This showed that the amount of offspring can be predicted quite accurately based on these three variables. The research also shows that the relationship between the number of days that the beetles lay eggs and the number of beetles per tray are inversely proportional. This means that the number of days times two or the number of beetles times two has the same effect on the number of offspring. With this model not only can be predicted the yield, it can also be used as steering mechanism. Now you can calculate how many beetles have to lay eggs for certain number of days to produce 1 kg of meal worms. The research by Inagro showed that 10,000 meal worms can grow from 110 grams of beetles, which lay eggs for 7 days in a 60x40 cm tray. In addition to predicting the number of descendants, the number can be steered active. To do this, one must harvest the eggs of the meal worm. This is easier said than done, because the beetle naturally want to stick her egg to an object, usually the floor. At Inagro mesh is developed for this purpose. The beetles lay their eggs loose in meal. The day after the eggs can be sieved perfectly from the flour. After that, a certain number of meal worms are dosed in trays. An advantage of this is to prevent cannibalism (beetles that eat eggs). This allows for a much higher yield in regards to the classical way of cultivation. David Deruytter (Inagro) during his presentation at EAAP.